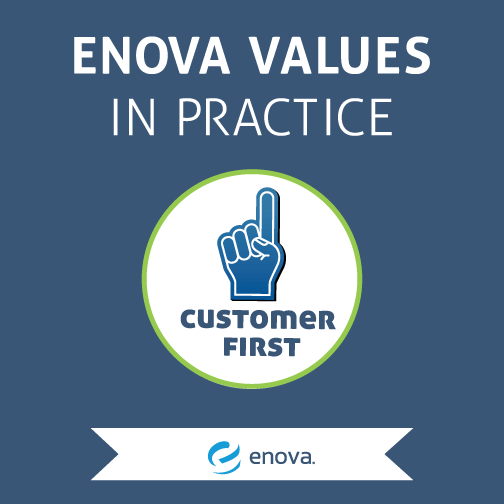 Enova Values in Practice: Customer First - Enova International, Inc. Some say, “Customer is King.” Here at Enova, we say “Customer First,” which is one of five values that infuse the work we do every single day. Putting our customers first entails listening to their needs, giving them options, and delivering beyond their expectations. It’s easy enough to say we put customers first, but what does that look like in our everyday efforts? Imagine you’re a social media analyst, and a customer comes to your company’s page to address an issue. You think you’ve resolved it, but the customer comes back later to say they still aren’t satisfied. What do you do? If you’re Jennifer, one of Enova’s social media analysts, you team up with call center section manager Walter to do your best to find a solution that meets the customer’s needs. Walter and Jennifer consulted the customer’s account history and kept up a dialogue with her on social media. Together they found the solution that worked best for the customer’s specific needs. We’re always innovating. As our customers’ needs grow and evolve, so does our business. Enova employees work hard to polish current products, as well as introduce new ones — such as QuickQuid FlexCredit®, which launched last year. Even more new products are in the works for the coming year.